I feel like when I was a kid the adults in my life would always tell me that I could be anything I wanted to be, I could do anything I wanted to do. And in my child’s mind I thought, “Hmm, I bet I’ll never grow bird wings and be able to fly like a bird.” So I thought that it was a weird thing to say. But as I got older I realized that their intentions were good and that they were trying to tell me that whatever I wanted to be and do I could do, so long as it works with the laws of physics. But anyway… As it turns out, when I was finally a grown up it became apparent that some of these same people, and most people I knew, no longer encouraged me to be and do whatever I wanted. It had been made clear over the years and especially once in adulthood that actually, no, I couldn’t be and do what I wanted. If I stepped outside the boundaries of what everyone else was doing, what was considered “safe” in our society, if I didn’t decide to succumb to a well paying job despite if it stole all of the joy out of my life, then I couldn’t do it, I would be doomed to fail. Some of the things I have heard when speaking about what I wanted to do with my life that were coming straight from my heart were “You have to be realistic,” “What are you going to do for money?,” “How are you going to make money doing that?,” “You can’t do that to make money,” sometimes they would laugh, and tell me “You’re so cute,” or “You can’t do this thing that you are completely passionate and excited about by yourself, how are you going to do that?,” “You spend a lot more time and energy trying to figure out how to not have to work than you would if you just worked at a regular job.” In a lot of these cases the people saying these things were well-meaning, they really just wanted me to be OK and be able to support myself, make me think everything through carefully, and sometimes maybe they were just curious because I was talking about ideas they hadn’t really heard others talk about, and I’m sure in pretty much all of the cases didn’t realize that it actually made me not believe in my own ability. To make matters worse, I only started hearing these things when I was finally actually touching on my heart’s work, my truest desires for my life, when I found things related to my soul’s purpose, and my truest self. When I used to want to get a teaching credential and become a high school teacher, straight out of high school, I never heard those types of things, despite the fact that at that time, and probably still, there was a pretty high shortage of positions as public high school teachers. But it was a normal path that a lot of people had already done, a respectable job, even if not super well paying. Apparently it was mainstream enough that people didn’t question my ability to do it successfully. But I decided it wasn’t for me, I didn’t want to work in an environment where the majority of my students wouldn’t really like me all that much. I didn’t want to be confined to having to follow the mandated rules of the public school system. Part way though my college education my heart nudged me to take a different path. It was after that, once I actually started listening to what I really wanted, liked to do, and was interested in, that I started hearing more and more doubts from the people in my life, including friends, family, and acquaintances. And as time went on I kept finding more pieces to the puzzle of what I wanted my life to be. And the more I found out about my true self and what I wanted, the more I was discouraged by others and the more people planted seeds of doubt in my mind. Its a cruel world how when we are children we are praised for the smallest of accomplishments, everyone tells us they believe in us and know we can do it, and then by the time we reach adulthood and find our true voice everyone stops believing in us. And then we stop believing in ourselves. Because how can we believe in ourselves if most of the people we know, who know and care about us, don’t believe in us? For me, well, I got to the lowest point of my life, I was so depressed I didn’t want to live anymore. There was a life I wanted to live but no one believed it was possible, so I also didn’t believe it was possible, and the alternative was living the only life that anyone seemed to think was possible, a life where I would have to surrender to work that goes against my deepest values in order to have enough money to be able to put a roof over my head and food in my belly. But I had already been doing that for a long time and it had brought me into the deepest depression. I couldn’t live like that anymore. So my choices as I saw them were basically to stop living and be done with this life, or to go after what was in my heart. I chose the second one. I separated myself from the voices of everyone outside of myself. I quieted my own self down. I waited. And then I started getting cues from my body and my heart, and I began following them. I had nothing left to lose. I felt so separated from the people in my life, my life was pretty much the opposite of what was in my heart. There was really nothing for me to lose because I felt like I had nothing anyway. I started dreaming of what I wanted, and I wrote these dreams down on some paper. And I started slowly but surely working towards the life I wanted. I was determined. People still doubted me, continued to doubt me as I was moving forward, and still doubt me today. Sometimes I still doubt myself. But then my heart speaks to me and tells me to keep going, if I keep going I’ll have the life I want. And in some ways now I already do. If I had followed all of the doubt… and never decided to believe in my dreams and take actions despite the doubt… I would still be miserable, if I had even decided to go on living at all. What I have wished had been my reality instead, and what I want to give to others, is that since childhood on through until the end of my life, so long as what I wanted to do wouldn’t be destructive to others or the planet, I would have been encouraged to trust my heart, to follow my instincts, to do what I love to do, and to be told that I could do it. I wished I had been told that I could be successful financially doing these things if I really wanted to. In fact, I wished I were told that following my heart would be the only way to have success, of any kind, in any area of my life. It is a shame shame shame that most people are brought up to feel that they need to fit the status quo in order to have a good life and be accepted by others, and then they pass this belief on to others, and they pass it on, and so on. I believe it is the opposite. I believe if everyone is taught to take good care of the environment, themselves, and others, and aside from this, be their unique and beautiful selves whatever that looks like, that we would all benefit greatly and have a much more interesting and beautiful world and live more fulfilling lives. The world needs more of this, more encouragement and belief. The people who cast seeds of doubt in me and all of you need this too, if they hadn’t had seeds of doubt planted by those in their lives they wouldn’t re-sow the same seeds. But it’s actually really cool because now that we are aware of this cycle, we can put a stop to it and create a new cycle that is more cheerful, encouraging, and enlivening. So, how does all of this have to do with YOUR DREAMS? Well, if you go deep inside your heart and find your deepest dreams, the biggest most “unrealistic,” “impossible” dreams you can find, and you decide to move towards your dreams a little bit everyday, despite your doubters, and even your own self-doubt, I believe that you can make your dreams come true. It truly doesn’t matter how outlandish your dreams are, so long as they come from your heart and as long as you create them ethically, without harming yourself, the planet, or others. It could be as fantastical as one I have, which is to create my own magical enchanted forest when we finally own our property with some woods. 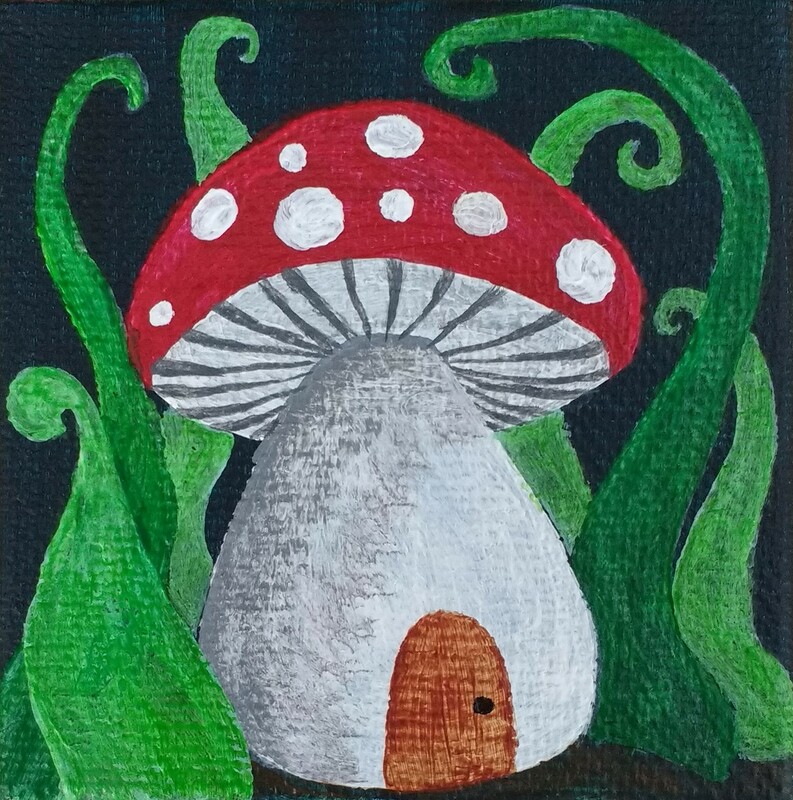 It will be the natural forest and I will add fairy gardens, and toadstool seats, and little doors on trees, and all different little bits of whimsy. I will create a fantastical forest of my own, and I will have community events where we can dress up and play games in the forest, and have mad tea parties, and make whimsical art. Maybe you want to create real-life energy efficient cloud cars like Care Bears drive! But there can be other more serious dreams, like another one I have, to be able to support myself and our future family by helping people find and fulfill their own dreams and by offering my artwork to the world, and teaching people about nature, sustainability, and self-sufficiency. I’m telling you, DREAM UP EVERY ASPECT OF YOUR LIFE, NOTHING IS TOO BIG OR TOO SILLY. Once you dream up all of the things you want for yourself, start taking action. So long as you take action, even the tiniest action, you will begin making your dreams a reality. REMEMBER! No matter what doubt you hear from those around you, even those you love and who love you, and even your own doubt, continue dreaming and taking actions, and you are guaranteed to move in the direction of your dreams, and you will help those around you doubt a little less. And while you are at it, cast some encouragement and belief on others when they speak of their dreams.